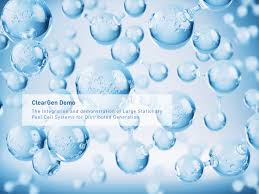 Jema is one of five partners of CLEARgen Demo Project. This project is the Integration and demostration of Large Stationary Fuel Cell Systems for Distributed Generation. Development and construction of a large scale fuel cell system, purpose-built for the European market. Validation of the technical and economic readiness of the fuel cell system at the megawatt scale. Field demonstration and development of megawatt scale system at a European chemical production plant. The demonstration site was chosen for the ability to provide a strong reference case so as to convince future operator of the relevance of large scale stationary fuel cell applications. It is expected that the project demonstration will show that systems are environmentally friendly and commercially relevant for chemical process industrial applications. CLEARgen is sited in Martinique, oversea territory of France.